By embracing social media, the United States military not only stays abreast of the latest technology developments, but it also continues to improve communication and, thus, the morale of its forces. As a result, the ways the U.S. Army markets itself to potential recruits has also become more fluid and more transparent. Last February, the Pentagon reversed its ban on social media websites like Facebook, Twitter, YouTube, MySpace, and on tools like Google Apps. While the commanders in charge apparently still have the right to ban social media at their discretion for security reasons, this policy has made it easier for families to stay in touch. Since then, the military has established a presence on Facebook, Twitter, YouTube, Flickr, and other sites, with thousands of followers on Facebook and Twitter alone. Soldiers and their families can share photos, send instant messages, use webcams, and post on blogs. 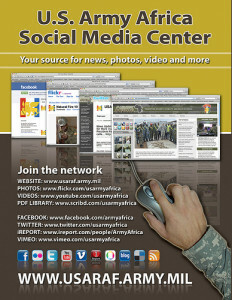 The Army.Mil social media site invites soldiers to submit social media pages of their own organization for approval and promotion on the army’s official social networking sites. Another official U.S. Army site, Go Army, has Army Strong TV with several channels under one umbrella, “Real Soldiers, Real Stories,” and information for parents and recruits, a discussion board, and information in Spanish, among other resources. We feel that the nation’s best credentials to the Army are our own soldiers. If someone’s thinking about the army as a career, and they have fears or concerns or questions about perhaps being deployed to Afghanistan, the best way to get those questions answered and to allay those fears is through our ‘Army Strong Stories’ or ‘Straight From Afghanistan,’ where they can go online and ask those questions directly to the soldiers and the participants in the community. There is no corporate voice on those sites — it is 100% populated and answered by members of the community who voluntarily join up. [I]f you look at it five years ago it was primarily advertising-centric, and I don’t think we’re a-typical in that regard of other advertisers and marketers in that period. And the consumption of both media and information among our target audiences has changed so much. I think one of the things we’re most proud of is that we’ve been very fluid and very nimble in changing with those consumption habits of our target audiences. I think any institution that’s been around for 235 years is probably subject to stereotypes of what they once were. All you have to do is watch Saturday Night Live and realize there are parodies of everything. We just happen to have a longer history… so of course those stereotypes are out there and they’re perpetuated in things like Hollywood and video games. What we try to do with the marketing is tell the honest story about what it’s like to be in the Army. Image by US Army Africa, used under its Creative Commons license.